Now its apt to talk about the actual recipe - Munthiri Kothu. 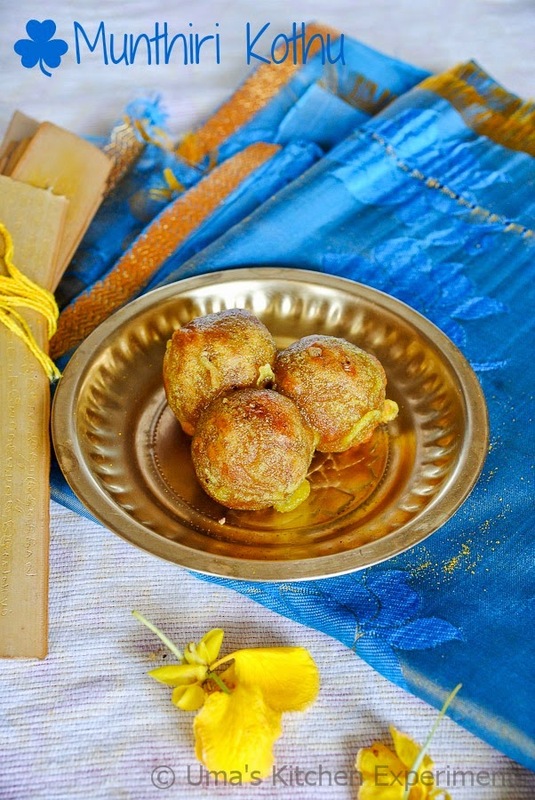 A traditional sweet from southern Kerala and Tamil Nadu, especially in the kanyakumari and Thirunelveli district. If you translate the recipe name directly into tamil, you get as Cashew Nut bunch. But to your surprise, there is no relationship between cashew and this recipe and it doesn't even use cashew in it. 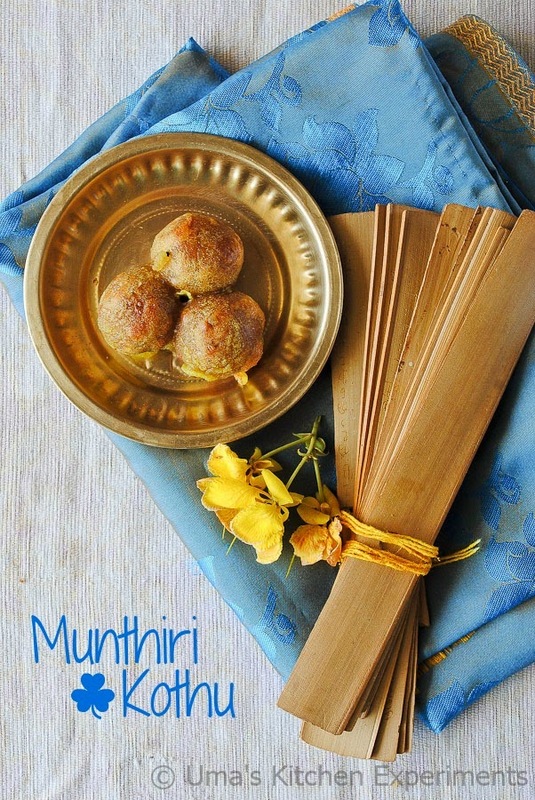 In colloquial Tamil of southern districts of tamilnadu and in kerala, mundhiri translate as grapes. It is also deep fried as bunches of three or four which resembles a bunch of grapes, hence the name. I prepared it in a bunch(kothu) of three but it can also be prepared as a bunch of four or five. The process of making this sweet is long and it requires patience and care because of which we used to prepare it only during the festival and functions. Since it has longer shelf life in room temperature, We prepare it in a big batch but believe me before that you finish off everything. Wishing all my readers a very Happy New Year 2016! 1) Dry roast moong dal in small batches for even roasting. I used 1/3 cup of moong dal each time in 6 batches.Transfer the contents to a plate and cool down. 2) To the same pan, add grated fresh coconut, fry till it becomes crisp and contains no traces of moisture in it. Now transfer the contents to another plate and allow it to cool down. 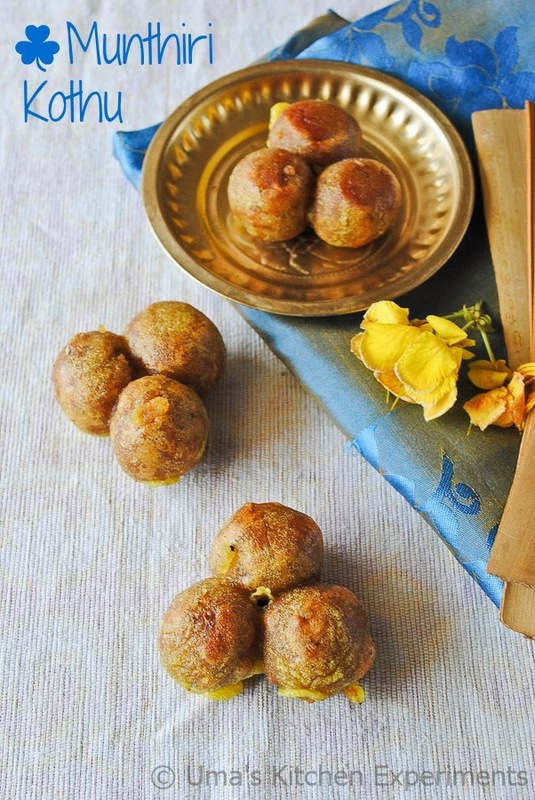 3) Make a powder of moong dal by grinding it along with green cardamom and dry ginger powder. A coarse grind would also be fine. 4) Heat jaggery in a wide pan. Add water just to immerse the jaggery. 5) Once the jaggery melts down, filter it to remove the impurities. 6) Now heat the jaggery once again and allow it become slightly thick and frothy. 7) Turn off the heat. Add grated coconut and powdered moong dal. 8) Add a pinch of salt and mix it well. Allow it cool for sometime. 9) Take a small pinch from it and make an amla sized ball(size can be varied as per personal choice). Allow this to cool down under a fan if you are making it immediately or keep it for overnight for the next day's preparation. 10) The stuffing is ready meanwhile you can prepare the outer cover. 1) Wash and Soak the rice in water for an hour or overnight. 2) Grind it to a smooth batter (slightly thicker than the dosa batter) by adding enough water. 3) Add salt and turmeric and mix well. 4) The batter is ready. 1) Heat oil/ghee in a wide pan. 2) When it is hot but not smoking hot, pour few drops of batter. The batter floats on the surface of oil. This is the right temperature for deep frying the munthiri kothu. 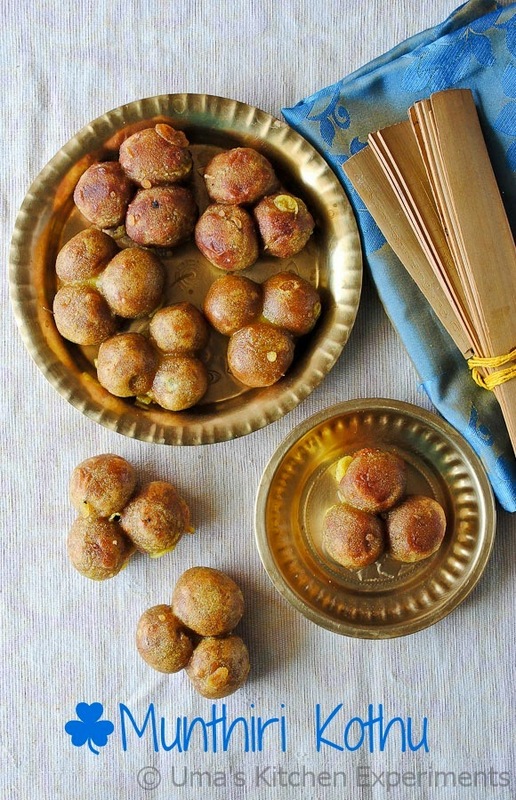 3) Take 3 moong dal jaggery balls, form a bunch of three, by making sticking it with each other if possible. 4) Carefully dip it into the batter and slide it down in the hot oil. 5) Carefully fry it till it is cooked and the colour of outer cover has changed. Now transfer it to a plate covered with kitchen towel to absorb excess oil. 6) Once cooled, store in a clean dry container. It stays good for a week time. 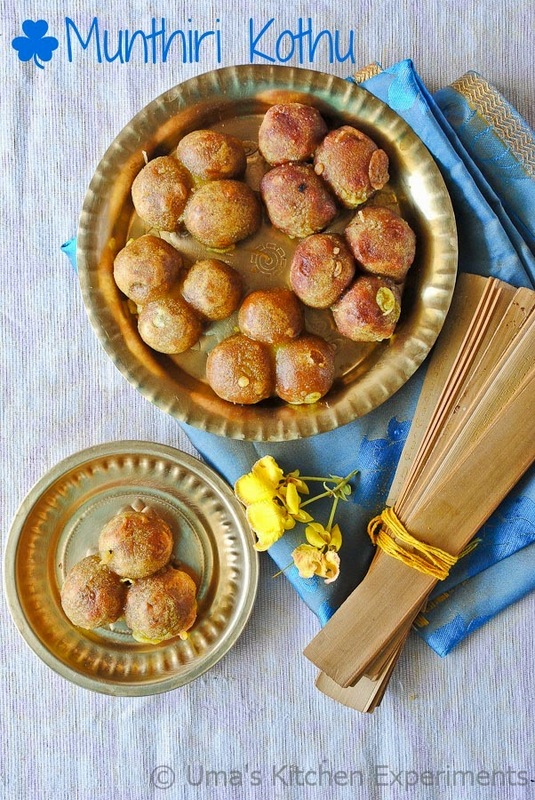 1) If you are not able to make it as bunch, feel free to fry as individual balls. Shape doesn't matter. 2) You can also use thin batter just to coat the bunches or thick batter. Its your choice. Traditionally it is prepared as slightly thicker than the dosa batter. 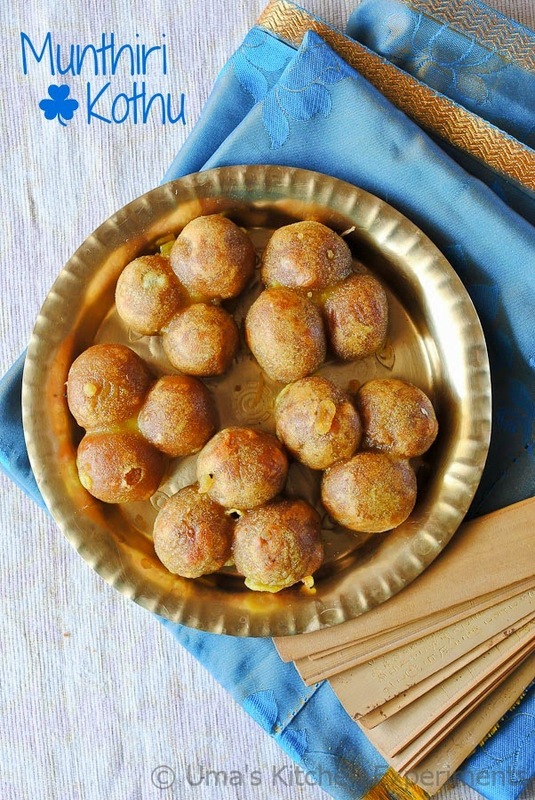 3) Instead of ground rice batter, you can use rice flour or maida or dosa batter. But ground dosa batter and rice flour batter gives a longer shelf life. If you use dosa batter, there is a slight change in taste. 4) I was left with some batter after I was done with all the bunches. nice pictures..very new to me and quite interesting too..